Steiff Ollie Owl is hand made in the finest rose brown cuddly soft plush. 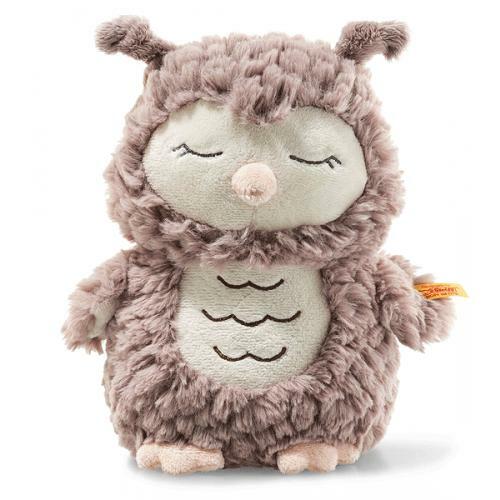 The 23 cm tall Soft Cuddly Friends Ollie owl is a cuddly little animal with closed eyes, which are embroidered in a beautiful, shiny grey. The excellent material design offsets the rose-brown back of her head and body. The plush fabric for your baby's soft skin is really pleasant to touch and hold. She has cream-coloured tail feathers and soft, pink feet. Her small, cute beak is also pink. Her face, underside of the wings and tummy are made of short and soft, cream-coloured plush fabric. Her tummy is decorated with golden embroidery. Bean bags are sewn into her bottom.